100 % pure Styrian Pumpkin Seed Oil P.G.I. No product is as inseparably connected to Styria through its development and production as Styrian Pumpkin Seed Oil P.G.I.. It is a guaranteed natural speciality and is produced without the addition of other oils, food colourings, aromas or preservatives. 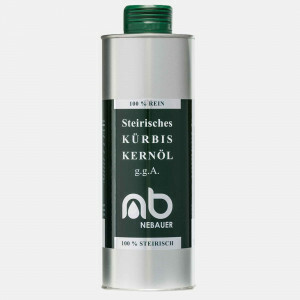 NEBAUER´s Styrian Pumpkin Seed Oil P.G.I. is a true gift from nature. It is a guaranteed natural speciality and is produced without the addition of other oils, food colourings, aromas or preservatives. It gets its typical and one of a kind character from the Styrian earth the Styrian oil pumpkin grows in. 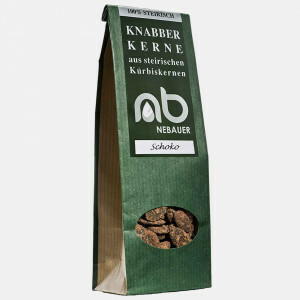 So what makes the Styrian pumpkin seed oil from NEBAUER so special? Producing natural top quality products means taking responsibility for nature and farming. Our sun-rich climate is in addition to the unique earth a prerequisite for our high quality. Especially the temperature changes between day and night, as well as the sun-rich autumn, provide us with the best pumpkin seeds. Our carefully selected pumpkin seeds are sourced either from our own farm based in the center of the main styrian pumpkin growing area in the south of Styria in St. Georgen/Stiefing or 100 % from the traditional P.G.I. farming area. The pressing of pumpkin seed oil requires a great deal of experience and care and is carried out by hand. Our traditional Styrian stamp pressing process ensures the unrivalled flavour. 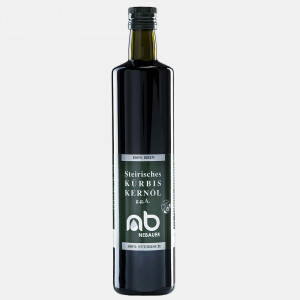 NEBAUER´s Styrian pumpkin seed oil P.G.I. is recognised and recommended as a high quality product with an unique taste. It received the Styrian State Prize in gold since years, the last one in 2017. 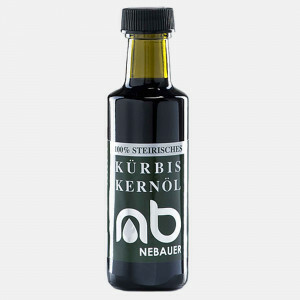 NEBAUER´s Styrian pumpkin seed oil is excellent for salad dressings and for spicing up various dishes. We are specialiced to ship our natural delicacy all over the word. NEBAUER can look back at over a hundred years of experience and success producing oil from the plump, dark green and shell-less Styrian pumpkin seeds. The GMO-free pumpkin seeds are sown in the end of April or beginning of May when the temperatur of our soils reach a minimum temperatur of 12 degree celcius. Our pumpkins are sown in rows with a single sowing machinge and a total of 18.000 seeds per hectar. Sowing our pumpkins in rows makes it possible to easily remove weeds by tilling the soil between them. Depending on the weather conditions, the harvest takes place between the middle of September and the middle of October, usually using modern seed harvesting machinery. Our seeds are only seldom harvested by hand, this involves laboriously halving the pumpkins and then the tedious work of separating the seeds from the pumpkin flesh, traditionally called "auspatzeln" in Styrian dialect. After they are harvested, the seeds are washed with drinking water, cleaned of remaining pumpkin flesh and dried for further storage. Through our traditional production philosophy we give our pumpkin seed oil the highest quality possible as well as its own character and charisma. From the careful cultivation of the pumpkin seeds to the expert roasting, all our traditional production practices guaranty an all-natural and unique quality product that an easily recognizable culinary delight. The pressing of the orginal styrian pumpkin seed oil requires a great deal of experience and care and is carried out by hand. Styrian Pumpkin Seed Oil P.G.I. has, with 80%, one of the highest concentrations of mono- and polyunsaturated fats of any oil. A high vitamin E content (averaging 29 mg / 100 g), that means one portion of Styrian Pumpkin Seed Oil P.G.I. (10 ml) can cover up to 20 % of our daily dietary needs (the recommended vitamin E intake for an adult is, according to current sources, 12 mg per day). The vitamin E is an antioxidant and, in the human body, plays a role in the protection of cells from oxidative stress. Furthermore, it prevents the oil from spoiling or going rancid too quickly. Styrian pumpkin seed oil is perfect for use in the kitchen and it's use as an accompaniment to wine or cheese tastings attests the wide range of possible uses. It can be used in a wide range of dishes, including: pumpkin seed oil scrambled eggs, pumpkin seed oil spread, steak with pumpkin seed oil butter, a variety of pumpkin seed oil marinades and dressings, pumpkin seed oil cake, and pumpkin seed oil vanilla crescents. With a little bit of fantasy and culinary know how pumpkin seed oil can be wonderfully used in any creative kitchen. Our pumpkin seeds themselves, apart from their role in oil production, can also be used in cooking and baking, or are also available as snack seeds in a most diverse and creative range of flavours. 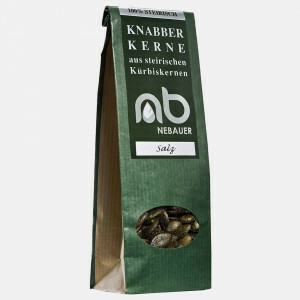 In addition to the traditional salted NEBAUER snack seeds, we also offer more flavour combinations, such as chocolate, vanilla or cinnamon. Suggestions and inspiration can be found in our recipe database. The pressing of pumpkin seed oil requires a great deal of experience and care and is carried out by hand. Our pumpkin seed oil is produced using a traditional Styrian stamp pressing process. In order to produce Styrian Pumpkin Seed Oil P.G.I. the seeds are first ground, then water and salt are kneaded into the ground seeds and then the mixture gently roasted. The expertise of our Press Master is very important at this stage in the production, because based on his knowledge he decides when the roasting process is completed and pressing can begin. The warm pumpkin seed mass is then pressed carefully using a traditional stamp press as part of a long process, without any additional heating. This releases the thick dark green oil. Nowadays, the oil millers have access to the most modern pressing equipment, which facilitates a gentle while also effective pressing. The fresh pumpkin seed oil is then stored for 7 days. During this time, all of the suspended solids and fibre residue sink to the bottom as part of a natural process. After checking the quality of our oil, the bottling takes place under hygienic conditions, without the addition of any additives or preservatives. Our bodies need a certain amount of fat intake for many reasons, but also because it is necessary for some metabolic processes. The important functions of fats in the body include the protection and cushioning of inner organs, forming the building blocks of the cell structure, high calorie energy source, enables the absorption of fat soluble vitamins (vitamins A, D, E, K) and finally provides essential fatty acids that the body cannot synthesize itself. The subsitution of unsaturated fatty acids for saturated fatty acids contributes to a healthy diet and can help maintain a normal blood cholesterol level. Though, naturally, as a part of a varied and balanced diet in combination with a healthy lifestyle. Linoleic acid can positively affect the blood cholesterol level at a daily intake of 10 g of linoleic acid. There are ca. 4 g of linoleic acid in every portion (10 ml) of Styrian Pumpkin Seed Oil P.G.I. Oxygen, warmth and light stimulate the degradation of the unsaturated fats in pumpkin seed oil and cause the oil to quickly go rancid. This is why Styrian Pumpkin Seed Oil P.G.I. is stored in well sealed dark bottles or cans. It is possible to store an unopened bottle for 9 - 12 months at room temperatures lower than 18 °C, but of course the shorter the storage time, the better and nuttier the flavour. Opened bottles of pumpkin seed oil should be used within 6 - 12 weeks. As the oil is used, the ever increasing amount of air in the bottle is of ever increasing importance. The more air in the bottle, the more oxygen is available to oxidize the fatty acids in the remaining oil. It is possible that pumpkin seed oil can go rancid towards the end of a bottle; that the rest of the oil is not enjoyable anymore and that it ends up as waste oil. The best prevention is to buy a bottle fitted to your individual needs. That's how smaller bottles, of 250 ml or 500 ml, can ensure the quality and culinary delight last as long as possible. It is also a good idea to wipe the drops of oil away from the bottle's neck after pouring, this residue oxidizes very quickly. This rancid oil residue can lend its rancid flavour to the next dish where Styrian Pumpkin Seed Oil P.G.I. is needed, though the oil in the bottle is actually still good. Producing natural top quality products means taking responsibility for nature and farming. And this all starts in our fields. Our sun-rich climate is in addition to the unique earth a prerequisite for our high quality. From the careful cultivation of the pumpkin seeds to the expert roasting, our traditional production practices guaranty an all-natural and unique quality product that an easily recognizable culinary delight. 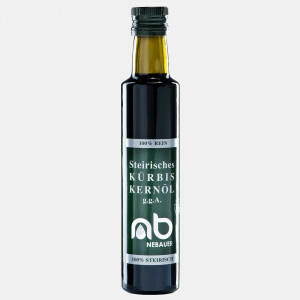 NEBAUER´s Styrian pumpkin seed oil P.G.I. is a true gift from nature. It is a guaranteed natural speciality and is produced without the addition of other oils, food colourings, aromas or preservatives. NEBAUER products are produced with great love. The pressing of pumpkin seed oil requires a great deal of experience and care. We are pressing weekly with a shelf life of 12 month. 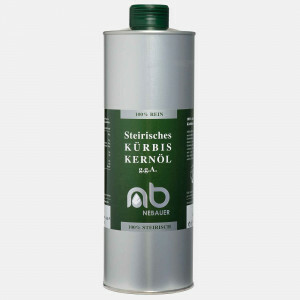 NEBAUER´s Styrian pumpkin seed oil P.G.I. is made exclusively from pumpkins which have been grown in the traditional EU-protected P.G.I. area. It´s natural, veggan and GMO free. Awarded Styrian pumpkin seed oil P.G.I. 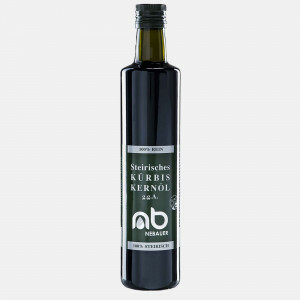 NEBAUER´s Styrian pumpkin seed oil P.G.I. is recognised and recommended as a high quality product with an unique taste. It received the Styrian State Prize in gold in 2018. Thats the second time I placed an order to be shipped to Michigan US. We have a group of friends who love the oil as much as we do. The quality is amazing and the shipping costs are fair. We love the cans so we dont have to worry about broken glass. Next year again - for sure. It was as we wanted and expected. The packaging was also taken care of very well and would buy again. No need for eating sparingly anymore with the delivery to my door. Thank you. Excellent product, love the taste as it’s been a long time since l have had any Kernoil and glad l have been able to get produce delivered to me. Obwohl es im Vorjahr der Wettergott mit den steirischen Kürbisbauern anfänglich nicht nur gut gemeint hat, ist das steirische Kürbiskernöl g.g.A. von bisher unvergleichbarer Meisterqualität - es hat in Geschmack, Farbe und Duft alle Ingredienzen für einen besonderen Jahrgang", freut sich Hermann Tappler, selbst Produzent und Inhaber des erfolgreichen Onlineshops kuerbiskernoelshop.com. Nach mehrmonatiger Vorbereitungsphase präsentiert Hermann Tappler, Inhaber von kuerbiskernoelshop.com, seinen gelaunchten Onlineshop. Der steirische Kürbiskernölspezialist hat sich schon sehr früh mit dem Internetversandhandel beschäftigt. MIttlerweile zählt der erfolgreiche Onlineanbieter weltweit bereits mehrere tausend Kernölfreunde zum zufriedenen Kundenkreis. Derzeit können wir noch nicht abschätzen, ob unser Kürbiskernölvorrat bis zur neuen Ernte 2015 reichen wird. Eines ist klar - es wird verdammt knapp. Aufgrund unserer strengen Qualitätsphilosophie kaufen wir keine Kürbiskerne unbekannter bzw. ausländischer Herkunft zu und bleiben unseren Prinzipien treu. Bei Neukunden bitten wir um Verständnis, dass wir nicht alle Wünsche erfüllen können. * All prices including legal VAT, without shipping.